Robo Challenge's army of Attacknid spider robots. Courtesy Robo Challenge. A lot of kids play with robots, and it’s clear that robots bring out the kid in many grownups. 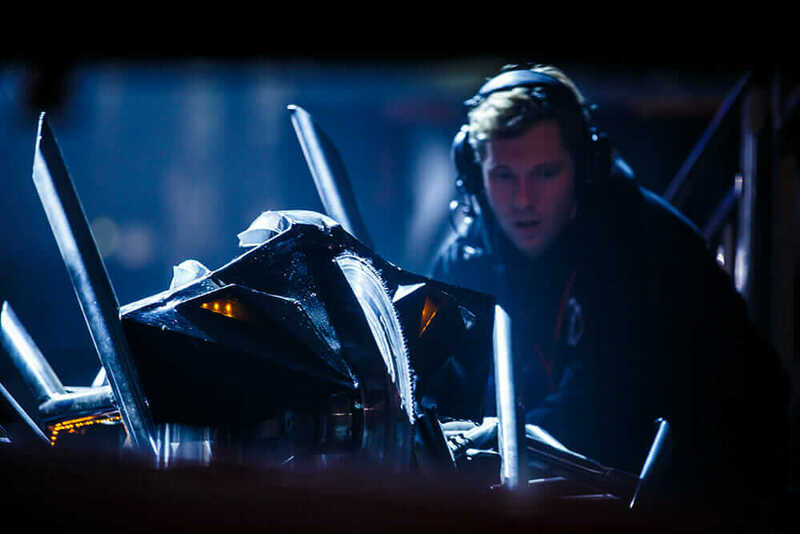 What else could explain the success of the Transformers movie franchise, the fascination with the Mars rover, or the popularity of TV shows like Battlebots in the United States or Robot Wars in the UK? Adding to the robot mystique is the jealous truth that only a lucky few get to make robots for a living. But for Birmingham, UK­­­–based Robo Challenge, it’s a family affair: Brothers James and Grant Cooper and their father are making all kinds of robots—while commanding lots of attention with their work. Grant Cooper with one of Robo Challenge’s Robot Wars creations. Courtesy Robo Challenge. Most robotics designers will study (and practice) in fields like exploration, medicine, or manufacturing, where function is the only requirement. Robo Challenge, however, has a unique position as a creative engineering consultancy. What does that mean? For Robo Challenge, it’s creating the coolest robotics projects ever. The Coopers build bots that battle on TV. They built a rover with a camera controlled by users for Samsung’s launch of a new mobile phone service. And for toy company Wow! 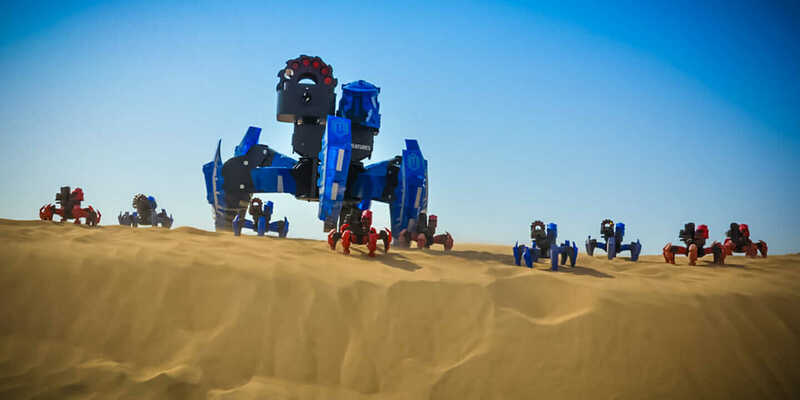 Stuff—which wanted to create a big promotional splash—Robo Challenge crafted an army of 5-foot-tall spider robots, supersize versions of the company’s Attacknid remote-controlled toys. 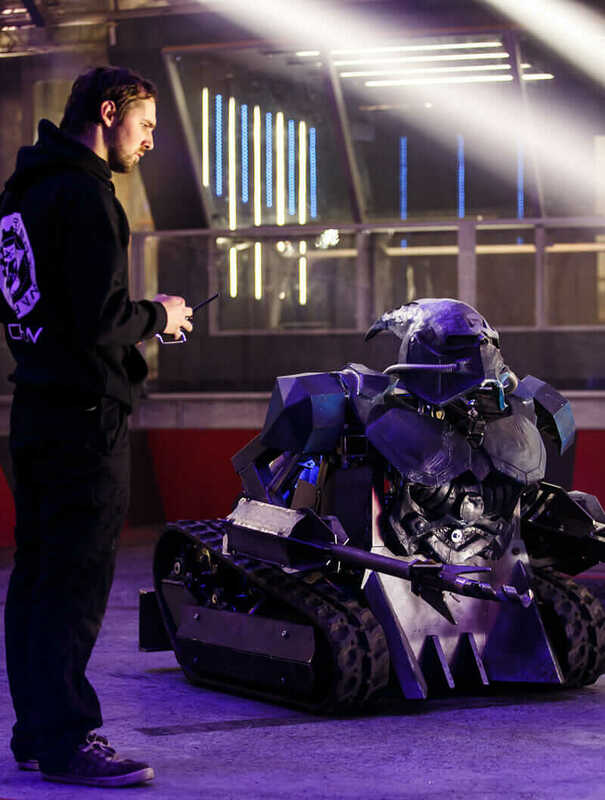 These and other clients—from the BBC to Cadbury, Converse, Microsoft, Samsung, Stan Lee’s Superhumans TV series, and even the Abu Dhabi royal family—have discovered that Robo Challenge can do just about anything. Traditional engineering, he says, requires a specific thought process. But when clients come to Robo Challenge and say, “We’d love to be able to do this; is it actually possible?” Cooper says, with a laugh, that the default response is always, “Yes.” Then comes the process of following up on the promise, and as he tells Robo Challenge clients, “Anything’s possible given enough time and budget.” Just ask Microsoft: The Coopers met a singular challenge to build a physically exact replica of the dogbot Mack from the Xbox game ReCore, flexing their engineering creativity with the help of Autodesk Fusion 360. Growing Up With Robots. The modern incarnation of Robo Challenge more or less started when television came calling. “We got pretty well known when we started competing and doing educational workshops on science and technology for schools, and then TV shows started getting in touch after seeing our work,” Cooper says. The brothers and their friends were already deep into the world of remote-control cars and made their own mods—thanks to access to their father’s central-Birmingham caster and wheel manufacturing business. Cooper and his brother fell in love with the British version of the TV show Robot Wars about 10 years ago (a show they’d end up building for), and after regular work on other UK TV shows, Robo Challenge started to make a real name internationally. Production companies, PR agencies, game and consumer goods makers, and even utilities came calling for projects of every size and kind. Cooper says that after the initial question of how to build it, working out each project’s possibilities is where the real fun lies. James Cooper with Robot Wars’ Dead Metal. Courtesy Robo Challenge. Today, as both a robotics lab and an art studio, Robo Challenge is aptly named. “We don’t just make props—everything has to have a functional aspect,” Cooper says. So unlike most robotics designers, both function and aesthetics have to be built into every step of the design. Robo Challenge does have a unique edge: The client relationships are key to this because the projects, themselves, play the starring role in inspiring the craziest and best ideas. Cooper calls it more of an evolutionary process in which collaborative development happens along the way. The New Future. Along with so many other manufacturing and design companies, Robo Challenge has seen its workflow transformed by technology—particularly 3D printing, CNC machining, and 3D design. Cooper remembers the days when everything had to be hacksawed and hand-bent, all from sketches that took a lot time to tweak (which made the manufacturing process even more time-consuming). Robo Challenge created the Wave Runner for the BBC children’s show Blue Peter and its entry into the Sport Relief 2016 fundraiser. Courtesy Robo Challenge. But no matter what the technology, technique, or tooling behind Robo Challenge, the brothers Cooper haven’t lost their passion for robots. Far from just a design-and-build vendor, Robo Challenge isn’t just making robots—it’s directly the entire experience of what the company’s creations go on to do.